KajaFax appears in the Leighton Buzzard Observer newspaper today in a fantastic story about the single release of ‘Death Defying Headlines’. 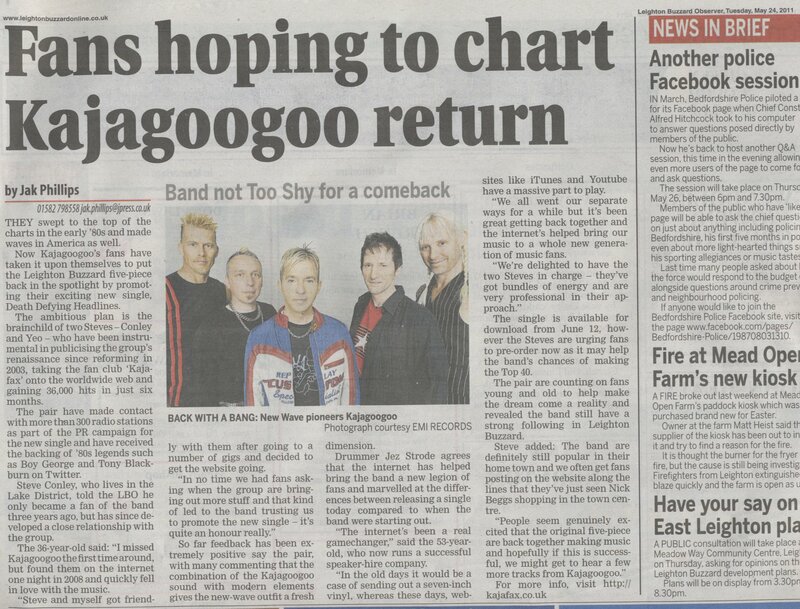 It’s the local newspaper for the band and they were very keen to pick it up and help us tell our story and promote the single. Jez and I both interviewed for the piece and it’s really great to see it down on paper and know that people are reading it today, hopefully coming to look around the site and even pre-order the single. Many thanks to Jak Phillips at the LBO for getting down the points we raised and writing a superb story for us. He’s nailed the facts and I really appreciate that. Many thanks also to Nick Beggs for sending the story over to me this morning along with a hearty ‘well done’. A really nice article. Thanks to the Leighton Buzzard Observer! Let’s hope that other papers take this story forward. What we need is everybody in Leighton Buzzard to buy a copy! I’ m very excited and happy for all concerned. Totally Amazing!! !